In 1972, Robert Harris opened his own design studio in Vancouver, B.C when he left Sparkman & Stephens. He branded his designs “Vancouvers.” Harris started with the 27 Vancouver, a nice pocket cruiser. 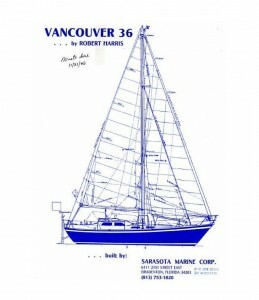 According to Andrew Dandridge, Harris originally designed the wooden 27 for a Vancouver couple to sail to New Zealand. 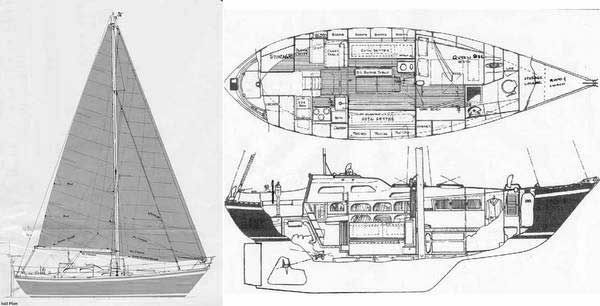 In 1974, Dandridge’s father, the owner of Pheon Yachts, secured Harris’ permission to produce the 27 in the UK and built a wooden 27 called Strider. Then, Pheon made a mold and went into production. During the same period Harris designed for Pheon a 32 Vancouver. Later, Ta Yang out of Taiwan would produce 32’s along with Pheon. With the lessons of the 27 and 32, Harris moved to the 36 Vancouver. This is a no nonsense tank – a boat that is meant to go places. Just slip the dock lines and head for the horizon. Harris continued the Vancouver idea stretching out the lines. The 36 like her sisters is a bluewater cruiser, heavy and strong. She has a classic cruising look – a powerfully straight raked bow and canoe stern. Her lines are modest with a subtle sheer. Most notable in look is her stepped cabin trunk similar to the pilothouse deck mold of her 42-foot sistership and perforated aluminum toe rail. Her stern is thick and full bodied and not for everyone. Compared to Perry’s Tayana 37, the canoe stern is wider and carried further aft. I confess that I prefer the 37 Tayana’s stern, but that does not minimize my admiration for this design. The Vancouver 36 was massively constructed – built beyond any reasonable standards. In 1977, Durbeck bought the rights from R. Harris and began production. Durbeck located in Sarasota, FL was already a yard with a reputation for heavy built cruisers. When Durbeck closed down in 1983, production moved next door to Hidden Harbor Boatworks. The Hidden Harbor yard went out of business like Durbeck in the late 1980’s. Between the two hards they produced 13 hulls. Both yards have a exceptional reputation for tough construction. They built these Vancouvers the way no manufacturer can afford and without any extra nonsense either. There is hardly any teak on deck for instance. They invested in value centric elements. The teak sole is 2″ thick, the hull 1′ 1/4″ thick made up of an impressive layup schedule of mat and roving with a Airex core. They built these yachts much like Corbin in three different delivery states. Those of Kit 1 just had the hull and deck molded together and were loaded on trucks. Kit 2 versions had the engine installed and operable to motor away from the factory. And finally, most 36’s were delivered as completed yachts, fully commissioned with factory interiors. There is no access to the chain locker on deck. She has a clean entry forward with maybe a removable fore stay. Deck space is wide upfront while aftmost the cockpit curves into the canoe stern. She has a great arrangement for a wind vane. The cockpit is tucked in and kind of tight but then again seaworthy – a trade-off as a bluewater sailor you will make any day. The rig is beefy and the deck hardware outrageous. Going below, she has 6’4″ headroom with a step down into the saloon. The finishing is white Formica – functional and surprisingly modern. Combined with the pilothouse windows, she has an open and naturally light salon. All the way forward is the head. The owner’s berth is just aft, a portside Pullman. An interesting feature is the keel stepped mast unlike the deck stepped mast of her 42-foot sister. Harris in-lined the mast with the main bulkhead forward. The design hides the mast cleaning up the interior lines. The saloon itself has settees both starboard and port. Storage is behind and below in every possible place. Aft of the saloon portside is the navigation station. To starboard is a U-shaped galley. The galley is secure and versatile but small although one owner touts cooking Thanksgiving for six. She is a great liveaboard cruiser. All the way aft is the engine room accessible through the companionway and a portside door behind the navigation station. The old three cylinder 35 HP Volvo MD 17 C needs to be repowered if it has not been. These yachts were woefully underpowered. In fact, all 36’s have probably been repowered by this point. Luckily, the job looks like an easy one with the engine right open when you detach the companionway front. Access is also available behind the nav station in a tight area portside. One question I have heard is the displacement. People wonder how she sails because the 36 is one heavy boat tipping the scales near 20,000 pounds with a displacement length ratio of 378. Of course in light winds, she must be slow and no doubt great in heavy seas. Do you have to turn on the engine to come about? Sailing is about trade-offs and no doubt the 36, being such a heavy small boat, has some. But oh are there benefits too. Having a stout boat in the trades is a good thing. Along with her true cutter rig with the mast stepped near near the center of the boat, she handles heavy seas with ease under a reefed main and staysail. In the early 1980’s, Harris moved onto a one-off 38 steel version for Pheon and then one of the most famous cruisers of all time, the 42 Tayana by Ta Yang. The 42 pilothouse version looks the same on deck as the 36 with more classic accommodations below. Harris finished the series off with two reverse transom (i.e. not double ended) cruisers, the 46 and 65 also for Tayana. Harris is alive, well, and still designing today, 2009, at 86 in Vancouver, B.C. 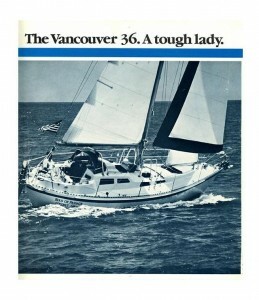 The 36 Vancouvers have proved to be a rare prize with 13 hulls produced from 1977 to 1986. Cherished by their owners, 36’s rarely change hands. You will find them with serious stories of far-off cruising in Caribbean and beyond. Brokerage prices hover below $100,000 for one of these tough ladies.